If you are currently doing disk-to-disk backups, especially large databases, you could save many hours of down time and millions of blocks of disk space by using BacPac. BacPac is from 3 to 10 times faster than OpenVMS Backup when saving files disk-to-disk, and has the added benefit of producing much smaller savesets. Comparison times on an Integrity Server running OpenVMS 8.3. System - Image save of 28 GB system disk. User - Image save of 50 GB user disk. 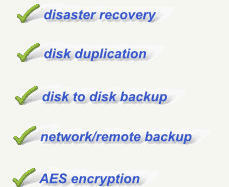 Database - Save of databse files approximately 2.2 GB.